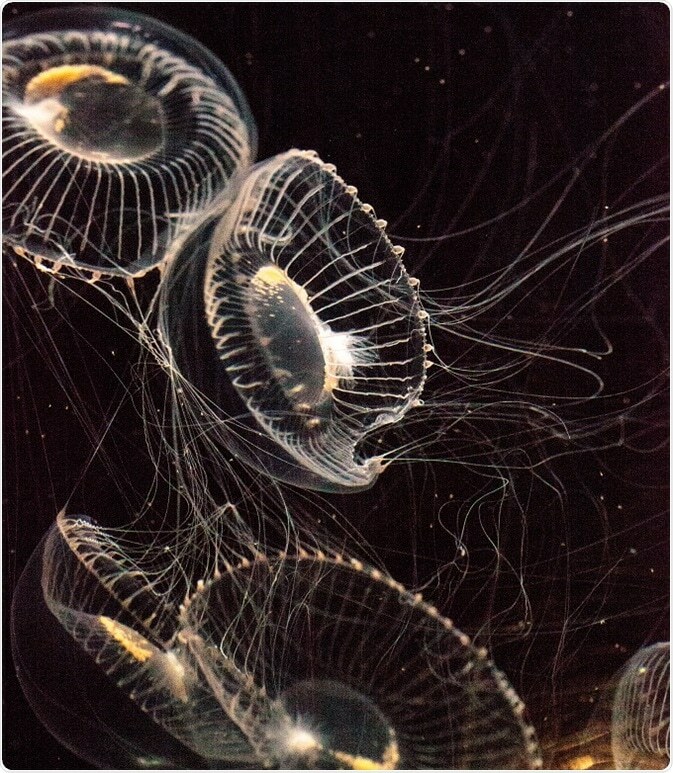 In biochemistry and cell biology, the most highly studied and developed protein is green fluorescent protein (GFP), which is derived from jellyfish Aequorea victoria. GFP has a remarkable capacity to efficiently radiate visible internal fluorophore that is extremely valuable and naturally attractive. Innovative chances are created by the high-resolution crystal structure of GFP to decipher and control the association between structure and spectroscopic function of proteins. GFP has been recognized as a marker in intact cells for gene expression and protein targeting. In biological studies, it is extensively used as genetically encoded fluorescent markers. This fluorescent marker enables multicolor labeling and is used in the study of interactions between proteins. GFP and its derivatives with different colors are utilized in several applications such as study of function and organization of the living systems in protein tagging, in examining gene expression, and in various biological selections. GFP provides researchers with a rich palette of different spectral and biochemical characteristic derivatives. The entire living cells or organism has been used as experimental system over a wide range of fields (cell biology and biomedicine) since the advent of GFP (autofluorescent protein). Since 1994, GFP has been serving as a scientist’s agent in the field of biotechnology as it needs only oxygen and an energy source to function. The fluorescent protein has become the first line of investigation into indefinite areas. It is used in various applications of biotechnology such as protein fusions, imagining whole organism, and transcriptional reporters. As a reporter for DNA and protein localization, GFP has offered highly sensitive and innovative approaches to study bacterial cell organization. This leads to new perceptions into various cellular processes. GFP possesses several characteristics useful for localized bacterial studies. Alternative to an immunofluorescence microscopy, the GFP gene expression is utilized to examine the primary cellular functions such as DNA replication, protein translation and signal transduction. Using GFP fluorophore, it is now possible to monitor DNA and protein localization revealing the essential proteins involved in sporulation and cell division and development that are dynamically identified during the cell cycle. The use of GFP in labeling multi-components within a single cell and for monitoring genetic material persist to make this approach a valuable tool to address the complicated uncertainties related to bacteria. GFP has a potential use in the study of bacterial pathogenesis. The host–parasite interaction of three bacterial pathogens Salmonella typhimurium, Yersinia pseudotuberculosis, and Mycobacterium marinum was studied using GFP. The use of GFP in host–pathogen study is widely successful since it is a low toxic cytoplasmic protein, capable of synthesizing continuously and, therefore, decreasing fluorescence-signal dilution effect on bacterial replication, and is easily imaged and computed in relation to living cells and tissues. GFP acts as a biological tracer that allows understanding of the colonization, proliferation, tenacity, and spread of pathogen in live animals. GFP is considered as the most important and powerful tool to monitor gene expression in different kinds of cells. It is favorably used as a reporter gene since it does not require any supplement of an additional substrate. GFP is used for mapping mec-7 gene expression in vivo in small nematode Caenorhabditis elegans. If exhibits a promising way to monitor the efficiency of gene transfer in transgenic animals and embryos. This protein is capable of acting as an indicator of the surrounding environment or in the organelle. Phosphorylation sites of GFP are engineered to provide modifications in fluorescent properties under a particular condition. The GFP engineered with potassium channel is the first optical sensor to be genetically encoded in membrane potential. The most thriving application of GFP is considering it as a genetically fusioned partner of host proteins to observe their localization and destiny. The GFP gene is fused with the gene encoding the protein of interest and expressed in the cell. The incorporation of GFP can be done at either the amino or the carboxyl terminus of a protein. The fused protein maintains its normal function along with acquired fluorescent property through GFP expressing gene. Through GFP, all major cell organelles such as plasma membrane, Golgi apparatus, nucleus, and endoplasmic reticulum are targeted. Overall, GFP can be used to visualize specific cell types in intact animals, organs, and tissues. This prospect is significantly useful in fields such as immunology, neurobiology, development, and carcinogenesis. Discovery of GFP mutants of several colored variants has led to the sustained progress of fluorescence instruments for cellular imaging and detection. The stimulating innovation of novel GFPs from other species has brightened the future application of GFP technology in the study of cellular, molecular, and drug discovery.